This exhibition will be part of all the wonderful work on show to visitors at the Knitting and Stitching show in Harrogate this week. 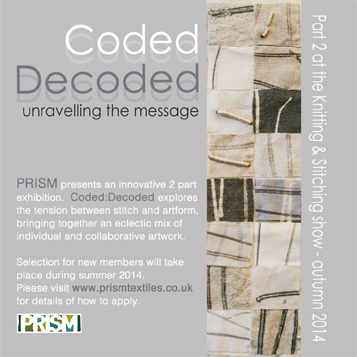 This entry was posted in Uncategorized and tagged Harrogate, Knitting and Stitching, Prism, textiles. Bookmark the permalink.